The background I made with the Journey Gel Press. Here is what a bunch of my backgrounds turned out like. Each one is a little different. One I sponged the edges, another I added a border with the Journey rectangle dies. They are pretty easy to make. I put a bunch drops of liquid color on the gel press in bubblegum and watermelon fusion. (like 10 drops each). Then I spritzed/mist it with water and then swirled them to blend. After that I put the Leaf Layers stencil on top. Then you press the whip cream card stock into the stencil to soak up the ink and water mixture. This first one is a botchy ugly mess but the next ones are fabulous. 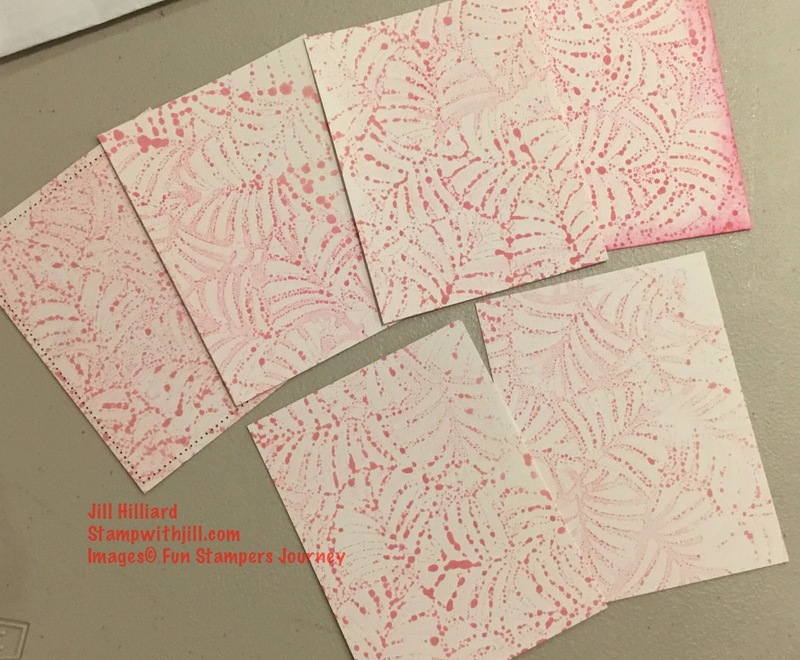 Peel off the stencil carefully (you will be using the messy ink on it), and then place a 2nd piece whip cream card stock directly on the gel press in the ink that is left. Then wipe the ink off the Gel press (baby wipe) and place that messy stencil ink side down on the gel press. Peel off the stencil, press the whip cream card stock into the ink. wipe off the gel press and then repeat the process a few more times. I made about 4-5 backgrounds before I had to start again. a big thanks to Glenda Caulkins for sharing this technique!! !